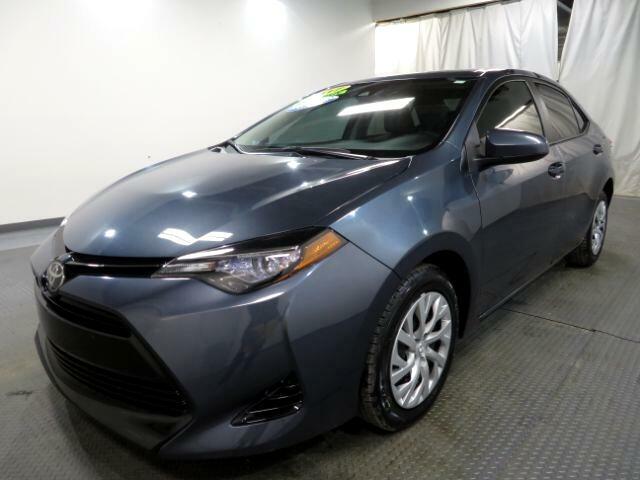 With proven reliability and masterful craftsmanship, 2017 Toyota Corolla LE is eye-catching in Black Sand Pearl! At the heart of our sedan is a 132hp 1.8 Liter 4 Cylinder that''''''''''''''''''''''''''''''''''''''''''''''''''''''''''''''''s perfectly matched with a seamless CVT. This ideal combination helps you achieve near 38mpg on the open road and represents the gold standard in its class. The modern stance of our Corolla LE is accented by LED headlights. A perfect balance of efficiency and style, it boasts ample leg room and cutting edge technology that is straightforward and user-friendly. Remote keyless entry, power door locks, automatic climate control, and steering wheel audio controls make every ride feel first-class. You''''''''''''''''''''''''''''''''''''''''''''''''''''''''''''''''ll also enjoy the Entune Audio touchscreen with an integrated backup camera, Bluetooth, an auxiliary audio jack and a USB/iPod interface. The Star Safety system adds peace of mind with stability and traction control, anti-lock brakes, and eight airbags. Safe, affordable, and dependable, the Corolla is an all-around smart choice! Print this page and call us Now... We Know You Will Enjoy Your Test Drive Towards Ownership! Internet Special, Interest rates starting Low as 1.99 for Qualified Buyers, Special financing available, Low monthly payments, No Credit, Bad Credit with still have Lenders that can Finance you! Log onto our direct website Nag-cars.com Two Location to choose from...Price Reflects Discount for Cash Buyers. Sales Tax, Title, License Fee, Registration Fee, Dealer Documentary Fee, Finance Charges, Emission Testing Fees and Compliance Fees are additional to the advertised price.